Canyon Creek Baptist Church in Richardson, TX features fluted columns made from GFRP, provided by Stromberg Architectural. Fluted columns provide beauty, class, and grace to all types of buildings as both an exterior and interior architectural element. Today, architectural columns are being constructed from fiberglass materials, offering a lightweight, flexible, and easy-to-install solution for architects and contractors. The fluted column has long, vertical grooves that go down the column whereas a plain column has no grooves. However, there are some different types of fluted columns based on the type of architectural order they come from and can be found as square fluted columns and round fluted columns. There are also other varieties of fluted columns. Adjusted flute columns have flutes that stop about one inch above the base of the column. There are also Ionic fluted columns and Doric fluted columns. An Ionic fluted column has a fillet between the flutes while the Doric fluted column has flutes that come together at a point. Which style is selected is based on the architectural design that is preferred for a particular restoration or new build project. Like all column types, the fluted column has transformed ordinary structures into impressive architectural masterpieces. The fluted column continues to be a popular feature for modern buildings, including courthouses, hotels, casinos and residences. • Fiberglass columns are lightweight, easing the load on a structure as well as providing for faster installation. • The fiberglass materials can be molded into a wide array of textures and shapes as well as finished with numerous colors. This allows for customization of any type of column. • Architectural fiberglass columns are weather resistant and low maintenance, providing a long-lasting and beautiful f external feature for a wide range of buildings types. The material can resist salt water, chemicals, and the environment. Some of the fiberglass materials have even withstood a Category 5 hurricane. 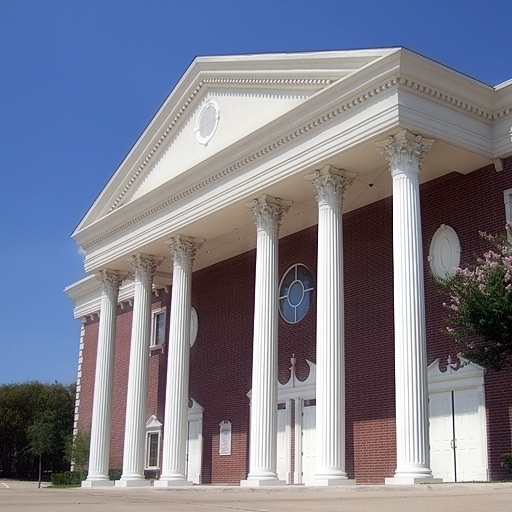 One of many examples of Stromberg Architectural Products’ work is the Canyon Creek Baptist Church in Richardson, Texas where there are both interior and exterior architectural fiberglass fluted columns that have been manufactured by Stromberg. The architectural fiberglass columns illustrate the majestic look of traditional Roman Corinthian fluted columns but are made to last thanks to the use of glass fiber reinforced polymer (GFRP). There are six stunning round fluted columns on the front of the church while numerous square fluted columns are found throughout the worship center. Both are embellished with beautiful ornamentation and provide beauty and durability for the church, including the ability to withstand the inclement weather and extreme heat conditions found in Texas. The Stromberg Architectural Products team has completed numerous architectural fiberglass fluted column projects for clients all over the world, including churches, hotels, courthouses, colleges and universities, and resorts and casinos. To receive your free custom quote or get additional information about our architectural fiberglass fluted columns, please call 903-454-0904 or fill out the online form.